Legislative leaders came achingly close on Friday to settling the weeks-long budget impasse with Gov. Phil Scott. Whether there was an actual deal or an informal agreement was a matter of interpretation; but at the end of a session that lasted until midnight, the House ended up abandoning attempts to find compromise between a Senate-passed budget and the governor, and approved the Senate bill, H.16, with a couple of minor changes. The end of the session was marred by Republicans' confusion and outrage over what they saw as a violation of parliamentary procedure. The dispute will lead to a revote on the bill on Monday — which is a mere six days from a potential state government shutdown. And the Senate will have to wait for the House revote. During an evening caucus, Scott told House Republicans that a deal had been struck on Friday morning between his administration and House leadership, "but it was taken off the table this afternoon." 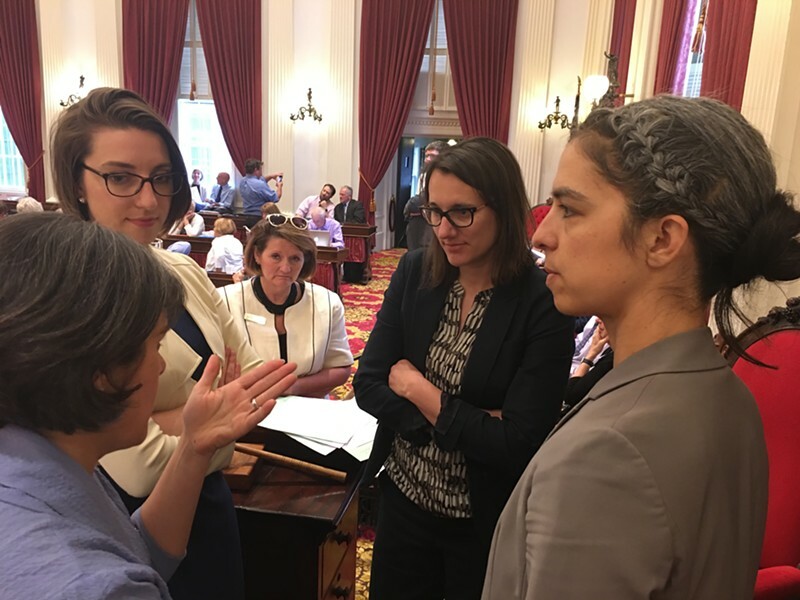 After the caucus, he further explained to reporters that House Speaker Mitzi Johnson (D-South Hero) told him Friday afternoon that "she was proposing further amendment after talking with the pro tem," referring to Senate President Pro Tempore Tim Ashe (D/P-Chittenden). In a written statement issued late Friday evening, Ashe did not directly address Scott's version of events. Ashe recounted the Senate's budget action this week and then stated, "The House has been instrumental as a partner to the Senate on every major piece of legislation, so we look forward to reviewing the changes being sent to the Senate on H.16." The Senate had approved H.16 with a unanimous vote Thursday afternoon. The bill was almost entirely a repeat of a budget already vetoed by Scott, with two significant changes. The Senate's Thursday budget would bring down the nonresidential rate by a single penny — still allowing a 4.5-cent increase to go forward. It would also add a major cost-control item on Scott's wish list: statewide negotiation of teacher health care benefits. But there was one item Scott was likely to oppose: Any extra revenue received by the state would be invested in the teacher pension fund. The Friday morning "deal" would have split any extra unanticipated revenue evenly between the state teacher pension fund and a temporary financial reserve that would buy down the 4.5-cent nonresidential hike at the end of fiscal year 2019, one year from now. That buy-down would depend on state revenues coming in higher than expected — which seems likely to occur. "It was a true compromise," said Scott. He would give in on his key demand, keeping tax rates level right now, in exchange for a reasonable expectation that nonresidential taxpayers would get a break in one year's time. But when that deal went sour, House leaders were left scrambling to craft a fresh one. 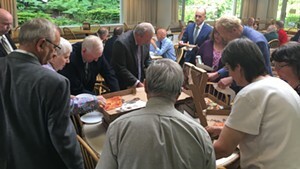 Negotiations went on throughout the afternoon and into the early evening; at one point, Johnson ordered pizzas for House members and staff. The move was greeted with ambivalence; it meant free food, but also the expectation of a long evening. At the end of the pizza break, House Appropriations Committee chair Kitty Toll (D-Danville) proposed a new version of H.16. Instead of a 50/50 split, it would have created a three-way division with one-third each going to the teacher pension fund, a reserve for the general fund and the nonresidential tax rate buy-down. "I don't love, it, I don't hate it, but at this point I don't care," Toll said in a hallway conversation with the governor, expressing the sentiments of many in the building. The differences between 50/50 and three-way amount to a few million dollars in each segment. The dollars were getting ever fewer, but sometimes it's the small things that cause big problems. And problems there were. After party caucuses, the House remained in recess until 10:00 p.m. It immediately became clear that something had unraveled. Instead of advancing her compromise proposal, Toll put forward the Senate version of H.16, with a couple of minor changes. The key element in House compromises — the 50/50 split or the three-way split — were out. As in the Senate's H.16, any extra revenues would go straight to the teacher pension fund, giving Scott little hope of achieving his goal of buying down nonresidential property tax rates. House Republicans were outraged. "This flies in the face of what I was told in the speaker's office earlier today," said Rep. Kurt Wright (R-Burlington). "This is not our finest hour." "A deal is a deal," said House Minority Leader Don Turner (R-Milton). "I'm very disappointed we're not adopting it tonight." It was a curious moment; the House's chief budget writer was essentially telling her colleagues to vote against an amendment she had herself proposed and shepherded to a unanimous committee vote earlier that evening. But even curiouser was just around the corner. After Scheuermann's amendment was rejected, Johnson called for a vote on Toll's latest bill. It carried on a one-sided voice vote — but Republicans didn't realize it was the final vote until it was too late. They protested that House procedure hadn't been followed — that there were still proposed amendments on the calendar that hadn't been debated. Johnson called a recess, and Republican leaders rushed the podium. "How can this be?" demanded Turner. "The question was asked," replied Johnson. "I asked if people were ready for the question." "But, Mitzi, that's not the normal procedure," said Rep. Anne Donahue (R-Northfield). "There were additional amendments on the calendar." "I didn't even know what we were voting on," added Turner. Johnson stood her ground. Turner then said that he would move for reconsideration of the vote. Johnson noted that in order to do so, Turner would have to have voted in favor of the bill. "Prove that I didn't," replied Turner. Which would be impossible on a voice vote. Johnson and Turner disappeared from the floor to discuss the situation. When they returned, Johnson called for a motion to adjourn and told the House, "We can expect reconsideration of H.16 when we return on Monday." If one of the two compromise plans had gone through, there was a reasonably clear path to resolution of the budget impasse. The Senate would have considered whichever compromise the House approved — either the 50/50 split of extra revenue, or the three-way split — and if the Senate concurred, the bill would be on its way to a governor who hadn't formally committed, but appeared inclined to accept either one. Earlier in the evening, Scott had expressed caution on Toll's three-way compromise: "I'm going to wait until the final product, then I'll weigh in at that point," he said. At the time, it seemed an exercise in typical Phil Scott caution. By midnight, it seemed like the smartest thing anybody said all day long. Correction, June 25, 2018: A previous version of the photo cutline accompanying this story misidentified Krowinski's title.